Is Saying Thank You Enough? This time of year I get sappy – like really sappy about being thankful. My kids have to hear it and verbalize what they are thankful for everyday and I try to share my thankfulness with others. But this year, I’ve decided that instead of just saying thank you I would #showthankful to those that have impacted certain parts of my day, month or year, but also to let those that support our company know how much that support means. So at Ashman we are #showthankful for the entire month of November! 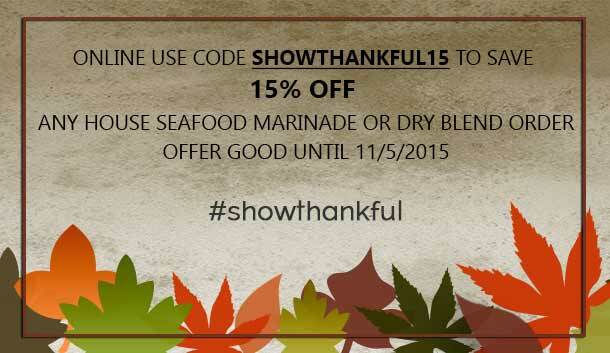 Our first #showthankful is an online coupon for 15% off our House Seafood Marinades & Dryblends.